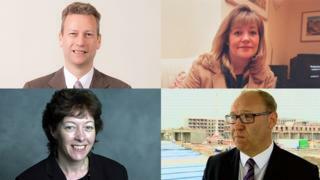 Two of Wales' four MEPs have confirmed they will not stand if European elections are held in May. After 10 years as MEPs, Labour's Derek Vaughan and Conservative Kay Swinburne said they would not be candidates. Following the extension to Brexit, the UK must take part in elections to the European parliament on 23 May if the country is still in the EU. Foreign Secretary Jeremy Hunt said it was a priority of the UK government to leave before the elections. On Twitter, Mr Vaughan said: "After much agonising I announced today that if there is a European election in May I will not be standing. "It's been a huge privilege representing Wales in the European Parliament for the last 10 years." Ms Swinburne said: "It has been a huge honour to represent Wales in the European Parliament over the last decade but the time has come for me to hand over the baton to someone new. "During the last 10 years I have been able to work with colleagues across the political spectrum on topics that matter to the people of Wales, the UK and across Europe." Wales' other MEPs, Jill Evans and Nathan Gill, have both said they intend to stand. Ms Evans is putting her name forward to run for Plaid Cymru again, while Mr Gill, who was elected for UKIP in 2014 before leaving the group, wants to run for Nigel Farage's new Brexit Party. UKIP has chosen Kris Hicks and Keith Edwards as its candidates.